Cooper caught six of nine targets for 65 yards and a touchdown in Saturday's 30-22 loss to the Rams. Cooper caught seven of nine targets for 106 yards during Saturday's 24-22 win over the Seahawks. Analysis: Cooper came up big in his first playoff game with his new team, leading the way in targets, catches and receiving yards. He didn't score a touchdown of his own, but he did make crucial contributions on three different scoring drives and moved the chains on several occasions. Cooper's presence adds another dimension to the offense, allowing Ezekiel Elliott and Dak Prescott to thrive, and he'll need to put on a similar performance next weekend whether lining up against the Saints or the Rams. 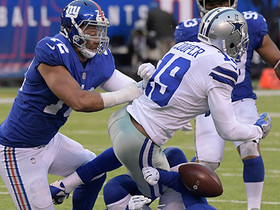 Cooper caught five of 11 targets for 31 yards during Sunday's 36-35 win over the Giants. Cooper said he wants to play in Sunday's game against the Giants, Jon Machota of The Dallas Morning News reports. Analysis: Locked in as the No. 4 seed in the NFC, the Cowboys are unlikely to use their key players throughout the entirety of the regular-season finale. 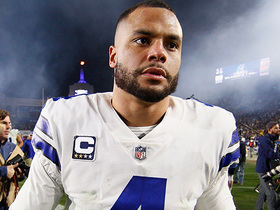 Based on the comments from team owner Jerry Jones, the Cowboys seem to be leaning toward giving the starters some run, but it's an uncertain situation that removes a large chunk of Cooper's appeal for fantasy purposes. Cooper brought in four of five targets for 20 yards in the Cowboys' 27-20 win over the Buccaneers on Sunday. Cooper caught four of seven targets for 32 yards and added an 11-yard rush during Sunday's 23-0 loss to the Colts. Analysis: Cooper came in with some big-time momentum after totaling 473 yards over the last three weeks, but he was held in check by an underrated Colts secondary. He recorded his lowest yardage total since joining his new team while posting his second-lowest catch total. Cooper will face a much more generous home matchup with the Buccaneers' porous secondary next Sunday and will look to get back to his productive ways. Cooper reeled in 10 of 13 targets for 217 yards and three touchdowns in Sunday's 29-23 overtime win over Philadelphia. Cooper brought in all eight of his targets for 75 yards and lost a fumble in the Cowboys' 13-10 win over the Saints on Thursday. Cooper caught eight of nine targets for 180 yards and two touchdowns during Thursday's 31-23 win over the Redskins. Cooper caught three of five targets for 36 yards during Sunday's 22-19 win over the Falcons. Analysis: Cooper finished tied for third on the team in targets and managed a long gain of just 17 yards. He was held off the board entirely in the first half and never really got going despite what looked like a favorable matchup on paper. This performance is a tough pill to swallow for Cooper's fantasy owners, who were surely encouraged by his first two efforts with his new team. He'll look to get back on track in another potentially favorable matchup against the Redskins on Thanksgiving. Cooper caught six passes on 10 targets for 75 yards in Sunday's 27-20 win over the Eagles. 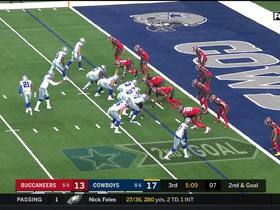 Analysis: Cooper wasn't able to find the end zone like he did in his Cowboys debut last week, but he still produced a usable fantasy line. By giving him 18 targets through two games, Dallas appears intent on feeding its new weapon. Dak Prescott doesn't provide Cooper with huge upside on a week-to-week basis, but the high volume should keep the wideout relevant in most formats. A soft matchup against an injury-riddled Atlanta defense Sunday bodes well for another strong game for the 24-year-old. Cooper caught five of eight targets for 58 yards and a touchdown in Monday night's 28-14 loss to the Titans. Offensive coordinator Scott Linehan confirmed Friday that Cooper would receive significant snaps in Monday's game against the Titans, David Helman of the Cowboys' official site reports. "We're not really easing him in," Linehan said of the newly acquired wideout. Cooper (concussion) wasn't listed on the initial Week 9 injury report the Cowboys released Thursday, Jon Machota of The Dallas Morning News reports. Cooper (concussion) is listed as a starter on the press release for Monday's game against Tennessee, Clarence E. Hill Jr. of the Fort Worth Star-Telegram reports. Cooper (concussion) reported to the Cowboys on Tuesday and is scheduled to practice with the team Wednesday and Thursday this week, Jon Machota of The Dallas Morning News reports. Cooper (concussion) has been traded to the Cowboys for a first-round draft pick, Adam Schefter of ESPN reports. Cooper (concussion) will be traded to the Cowboys, Josina Anderson of ESPN reports. Analysis: Cooper returned to the practice field Monday coming out of a bye week, and it now seems he'll take his next snap in a different uniform. We'll have more information once the trade becomes official. Cooper (concussion) is on the field for Monday's practice, Matt Kawahara of the San Francisco Chronicle reports. Analysis: Cooper suffered his concussion prior to a Week 7 bye, giving him 14 days to get ready for Oakland's next game. His presence at practice Monday is a good sign for his availability ahead of Sunday's matchup with the Colts, but it won't do anything to halt the rumors about a possible trade. Oakland won't release an official injury report until Wednesday afternoon. 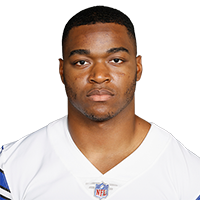 The Cowboys are believed to have inquired about Cooper's (concussion) availability via trade, Ian Rapoport of NFL Network reports. Analysis: That said, coach Jon Gruden has indicated that he's not shopping the wideout, but that stance could change if the right trade offer comes along. Cooper is currently in the NFL's concussion protocol, but the Raiders are on bye this week and he'll look to gain medical clearance in advance of next Sunday's game against the Colts. Cooper is still in concussion protocol Tuesday, Matt Schneidman of The San Jose Mercury News reports. Analysis: Cooper was forced to leave in the first half of Sunday's game against the Seahawks after suffering a helmet-to-helmet hit that resulted in a concussion. Reports also surfaced this week that Cooper is on the trading block, but if the wideout's concussion is serious, it could delay any possible transaction for the Raiders. The Raiders are asking for a first-round pick in trade talks for Cooper (concussion), Ali Thanawalla of NBC Sports Bay Area reports. Cooper (concussion) has been ruled out for the remainder of Sunday's contest against the Seahawks. Analysis: Cooper was held without a catch before sustaining a helmet-to-helmet hit during the first half of Sunday's tilt in London. His absence could allow for Jordy Nelson, Martavis Bryant and Seth Roberts to see additional targets from quarterback Derek Carr as the Raiders play from behind. Cooper (head) is being evaluated for a concussion after exiting Sunday's game against the Seahawks. Analysis: Cooper accompanied training staff to the locker after absorbing a helmet-to-helmet hit during the first half, so he'll need to clear the league's concussion protocol in order to have a chance at returning Sunday. If he remains sidelined, Jordy Nelson, Martavis Bryant and Seth Roberts would handle a majority of the snaps at wide receiver. Cooper headed to the locker room during Sunday's game against the Seahawks after absorbing a helmet-to-helmet hit, Vic Tafur of The Athletic reports. Analysis: Prior to exiting the game, Cooper did not catch a pass. If he's unable to return to action Sunday, added looks would be available for fellow receivers Jordy Nelson, Martavis Bryant and Seth Roberts. The Raiders and coach Jon Gruden might want to trade away Cooper and teammate Karl Joseph, Fox's Jay Glazer reports. Analysis: Glazer added that the Raiders are being more aggressive about peddling Joseph than Cooper, but it's eye-opening that Gruden isn't done cleaning house. Cooper drew just one target in Sunday's 26-10 loss to the Chargers, catching the pass for a 10-yard gain. Analysis: Add another chapter to Cooper's track record of inconsistency, with Sunday representing the nadir in terms of target volume. He cleared 100 yards in Weeks 2 and 4 but has caught just four passes for 36 yards in his other three games combined. It's a painful reminder of a 2017 campaign in which two outings accounted for 48 percent of his receiving yards. The Raiders will host the Seahawks in Week 6, giving Cooper a tricky matchup with a defense that's done nice work against wide receivers. Cooper (foot) doesn't carry an injury designation into Sunday's game against the Chargers after practicing in a limited fashion all week. Cooper (foot) was a limited practice participant Wednesday, Matt Schneidman of The San Jose Mercury News reports. Analysis: Cooper appears to have picked up a minor injury in the process of catching eight passes for 128 yards and a touchdown during Sunday's 45-42 overtime win over the Browns. His ability to practice -- even in a limited capacity -- suggests he's on the right track to suit up against the Chargers in Week 5.
Cooper caught eight of 12 targets for 128 yards and a touchdown during Sunday's 45-42 overtime win over the Browns. Cooper caught two of five targets for 17 yards during Sunday's 28-20 loss to the Dolphins. Cooper caught all 10 of his targets for 116 yards in Sunday's 20-19 loss to Denver. Analysis: Cooper wasn't targeted until the Raiders' fourth and final drive of the opening quarter but connected with Derek Carr for two quick strikes on a drive that would lead to Oakland's second field goal of the day. In the third period, Cooper caught deep balls for gains of 20 and 30 yards to set up a Seth Roberts touchdown grab. The 24-year-old has not found the end zone himself yet, however, and will try to remedy that Week 3 at Miami. Raiders head coach Jon Gruden said Cooper was open deep a couple times in Monday's 33-13 loss to the Rams, Vic Tafur of The Athletic reports. Cooper caught one of three targets for nine yards and added a nine-yard carry in Monday's 33-13, Week 1 loss to the Rams. Analysis: So much for putting his disappointing 2017 campaign behind him. Cooper averaged fewer than 50 receiving yards per game last season, and owners hoping for a return to the form that helped Cooper top 1,000 yards in each of his first two NFL seasons have to be wildly disappointed with this result. Tight end Jared Cook finished with 20 times as many receiving yards as Cooper in this game. Cooper caught his only target for a 49-yard gain in Friday's preseason game against the Packers. Analysis: Cooper jumped over a defender to snare an underthrown deep ball on the first play of the game, then logged just five more snaps before calling it a night. He's barely seen the field this preseason, with coach Jon Gruden emphasizing health over in-game reps. Cooper will open the regular season with a tricky Week 1 matchup against the Rams. Cooper will not play in Saturday's exhibition game versus the Rams for rest purposes, Michael Gehlken of the Las Vegas Review-Journal reports. Analysis: Cooper will get the day off along with several other starters. Head coach Jon Gruden does not want to give too much of their game plan away, as the Raiders will face the Rams once again in Week 1 of the regular season. Look for the Alabama product to see some snaps in next week's preseason game against the Packers. Cooper reported to training camp at 225 pounds, NFL Network reports. Cooper (hamstring) retook the field during Tuesday's OTA session, Michael Gehlken of the Las Vegas Review-Journal reports. Cooper has not returned to OTAs since suffering a hamstring injury May 22, Michael Gehlken of the Las Vegas Review-Journal reports. Analysis: There's no indication at this point that Cooper's hamstring issue is serious, so it's quite possible the team is holding its star receiver out of OTAs to ensure his health for the beginning of training camp. Coming off just a 48-catch campaign in 2017, Cooper figures to head the Raiders' receiving corps again, though the supporting cast has changed from Michael Crabtree to Jordy Nelson and Martavis Bryant. Cooper will face added competition for Derek Carr's attention after the Raiders traded for Martavis Bryant, Doug Williams of NBC Sports Bay Area reports. The Raiders picked up Cooper's fifth-year option Sunday, Josina Anderson of ESPN reports. Analysis: It's no surprise that the Raiders will bring back their top receiver for another season, even if he struggled in 2017. Cooper posted back-to-back, 1,000-yard seasons to begin his NFL career, but he only accrued 48 catches for 680 yards in 2017. The arrival of Jordy Nelson will keep some focus off Cooper and hopefully allow him to reach the 1,000-yard mark again. Raiders coach Jon Gruden recently compared Cooper to Tim Brown, saying he expects the 23-year-old wideout to be "the main vein of our passing offense", Scott Bair of NBC Bay Area reports. "[Cooper] has to get healthy and stay healthy," Gruden said. "We need him to be the player he was the first two years. I've said it earlier. We're going to make him the main vein of our passing offense and move him around a lot." Raiders head coach Jon Gruden said Wednesday that Cooper will be "the focal point" of the team's offense in 2018, Scott Bair of NBC Sports Bay Area reports. 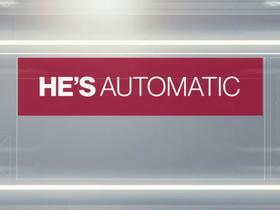 "He has tremendous quickness. He's smart, versatile and he's a gamer," Gruden said of Cooper. "He likes the bright lights, and he'll be the headliner in our offense." Cooper caught three passes on six targets for 115 yards and a touchdown in Sunday's 30-10 loss to the Chargers. He finishes up his 2017 campaign with 48 receptions for 680 yards and seven touchdowns on 96 targets in 14 games. Cooper (ankle) does not carry an injury designation for Sunday's game against the Chargers after practicing fully Friday. Analysis: Cooper returned to action in Week 16's loss to the Eagles, logging a TD on a 63-yard deep ball, while finishing with three catches for 66 yards overall. The 2015 first-rounder has found the end zone six times in 13 games this season, so he has a shot to help fantasy players in Week 17, but note that he could draw shadow coverage from standout cornerback Casey Hayward. Cooper (ankle) was a limited practice participant Wednesday, Michael Gehlken of the Las Vegas Review-Journal reports. Cooper caught three of four targets for 66 yards and a touchdown in Monday night's 19-10 loss to the Eagles. Analysis: Cooper's performance was buoyed by his 63-yard touchdown bomb during the first half, marking his longest play of this season. That play alone allowed Cooper to top 60 yards for just the third time this term. Although an ankle injury has slowed him lately, Cooper's return Monday will presumably leave him available for this weekend's season finale versus the Chargers, but with the Raiders now out of playoff contention, his status may still be worth monitoring. Cooper (ankle) is listed as active Monday at Philadelphia. Analysis: Cooper has missed two of the past three games due to a left ankle injury. Here's to hope he lasts longer than his last appearance Week 14 at Kansas City, where he was blanked on 15 offensive snaps. If so, Cooper could strike against an Eagles defense that has given up 182 receiving yards per game and six touchdown catches to wideouts over the last three outings. Cooper (ankle) logged a limited practice for second straight day Saturday and is listed as questionable for Monday night's game against the Eagles, Michael Gehlken of the Las Vegas Review-Journal reports. Cooper (ankle) was listed as a limited practice participant Friday. Analysis: We'll circle back on Cooper's status Saturday, but the Raiders are hopeful that the wideout will be able to play Monday night against the Eagles. Cooper has just one catch to his credit since Nov. 19, but if he's able to suit up Week 16, his return would provide the Raiders' passing offense with a boost, while potentially opening things up for fellow wideout Michael Crabtree and tight end Jared Cook (wrist). Cooper (ankle) returned to practice Friday, Michael Gehlken of the Las Vegas Review-Journal reports. Analysis: The dalliance with practice marks Cooper's first since aggravating a left ankle injury Week 14. While his activity level is unknown, Gehlken mentioned that Cooper "remains on track to start" Monday's game at Philadelphia. Whether or not he'd be able to manage a normal workload remains to be seen, but it may not be the best situation for a return because the Eagles have home-field advantage throughout the NFC playoffs at stake. Cooper (ankle) didn't take part in Thursday's practice, Vic Tafur of The Athletic Bay Area reports. Cooper (ankle) has been ruled out for Sunday's game against the Cowboys, Paul Gutierrez of ESPN.com reports. Cooper (ankle) isn't practicing Friday and appears unlikely to play Sunday against the Cowboys, Michael Gehlken of the Las Vegas Review-Journal reports. Analysis: The Raiders will provide a formal update on Cooper's outlook for the Week 15 matchup after practice concludes, but given that the wideout has failed to take the field in any capacity this week, he'll likely miss his second game of the season. With Cooper presumably out of the mix, Seth Roberts, Cordarrelle Patterson and Johnny Holton may all be in line for expanded snaps at wide receiver, but Michael Crabtree should continue rank as quarterback Derek Carr's top target at the position. Cooper (ankle) won't practice Thursday and doesn't appear likely to play Sunday against the Cowboys, Michael Gehlken of the Las Vegas Review-Journal reports. Raiders head coach Jack Del Rio said Cooper (ankle) won't practice Wednesday and is considered day-to-day ahead of Sunday's game against the Cowboys, Jori Epstein of The Dallas Morning News reports. Analysis: It's not surprising to see the Raiders hold Cooper out for their first practice of the week after he aggravated the left ankle injury that had been bothering him for the past two weeks during Sunday's loss to the Chiefs. Cooper will likely need to put in a full practice Thursday or Friday for fantasy owners to feel good about his chances of playing in Week 15, and even if he gains clearance to suit up, he may not make for a comfortable lineup option. Cooper, who missed the Raiders' Week 13 win over the Giants, re-injured his left ankle during Sunday's tilt against the Chiefs and is questionable to return, Michael Gehlken of the Las Vegas Review-Journal reports. Analysis: Cooper's potential availability for the remainder of Sunday's game is still uncertain, but the starting wide receiver was seen alone on the bench without his helmet prior to halftime. If Cooper is ultimately held out -- which may be the likely scenario at this point -- Seth Roberts and Cordarrelle Patterson could be in line for additional targets from quarterback Derek Carr. Cooper (ankle) is listed as active for Sunday's game against the Chiefs. Analysis: It remains to be seen how close to 100 percent Cooper is, but he'll give it a go Sunday, providing a boost to an Oakland offense that also welcomes fellow wideout Michael Crabtree back from his one-game suspension. Cooper profiles as a hit-or-miss fantasy option in his return to action, but he has scored in each of his last two outings. Cooper has impressed the Raiders with the improvement he's shown in his recovery from a sprained left ankle, with a source telling Ian Rapoport of NFL Network that the wideout has a good chance of playing Sunday against the Chiefs. Cooper (ankle) was a limited participant at Friday's practice and is listed as questionable for Sunday's game against the Chiefs, Michael Gehlken of the Las Vegas Review-Journal reports. Cooper (ankle) took the field for the start of Friday's practice, Michael Gehlken of the Las Vegas Review-Journal reports. Analysis: Though a Friday morning report suggested he isn't expected to play this week, Cooper will at least give it a go in practice to see how much his ankle has improved. Another update will be available Friday afternoon when the Raiders release their final injury report for Sunday's game against the Chiefs. Given that Cooper didn't practice the past two days, his best-case scenario is a 'questionable' tag and a game-time decision. Cooper (ankle) is not expected to play in Sunday's game against the Chiefs, Dan Graziano of ESPN.com reports. Analysis: After Cooper missed last week's game there was optimism that he would get back on the field in Week 14, but this report indicates he is unlikely to do so. More clarity regarding Cooper's status could come when the Raiders release their final injury report of the week, but those hoping to include Cooper in this week's fantasy lineups should have another option at the ready. Cooper (ankle) didn't practice Thursday, Michael Gehlken of the Las Vegas Review-Journal reports. Analysis: While Cooper has cleared the NFL's concussion protocol, his ankle is still an issue. The wideout has one more chance to return to practice this week, but at this stage his status for Sunday's game against the Chiefs remains cloudy. The Raiders will welcome fellow wideout Michael Crabtree back from his suspension this weekend, but added Week 14 looks await the likes of Cordarrelle Patterson (hip), Seth Roberts and Johnny Holton if Cooper is unable to suit up. Cooper cleared the NFL's concussion protocol Wednesday, but was held out of the Raiders' practice due to a left ankle sprain, Scott Bair of NBC Sports Bay Area reports. Analysis: As expected, Cooper's ankle represents the real threat to his availability for Sunday's game against the Chiefs. While it's encouraging that he now only has to worry about one injury , his failure to practice suggests there's a real chance he ends up sitting out a second straight week. The importance of Sunday's game for the Raiders' playoff hopes does increase Cooper's odds of playing, as the team presumably would be more inclined to let him take the field at less than 100 percent. Cooper, who is still tending to a left ankle injury, has not yet cleared the NFL's concussion protocol, Michael Gehlken of the Las Vegas Review-Journal reports. Analysis: On the plus side for the Raiders, fellow wideout Michael Crabtree is back from his suspension, but Cooper's progress will need to be monitored as Sunday's game against the Chiefs approaches. We'll update Cooper's status no later than Wednesday, when the Raiders submit their first Week 14 practice report. The Raiders are hopeful that Cooper (concussion/ankle) will be able to play Sunday against the Chiefs, Ian Rapoport of NFL Network reports. Cooper (concussion/ankle) has been ruled out for Sunday's game against the Giants. Cooper (concussion/ankle) wasn't spotted on the field for the start of practice Friday, Michael Gehlken of the Las Vegas Review-Journal reports. Cooper (concussion/ankle) didn't practice again Thursday, Michael Gehlken of the Las Vegas Review-Journal reports. Analysis: Gehlken portrays Cooper's chances of playing Sunday against the Giants as bleak. Meanwhile, Michael Crabtree is suspended for one game, which sets the stage for Cordarelle Patterson, Seth Roberts and Johnny Holton to head the Raiders' Week 13 wideout corps, barring an unexpectedly rapid recovery on Cooper's part. Cooper (concussion, ankle) did not practice Wednesday, Michael Gehlken of the Las Vegas Review-Journal reports. Analysis: Per the report, Cooper is considered unlikely to play Sunday against the Giants and with Michael Crabtree suspended for one game, Cordarelle Patterson and Seth Roberts could potentially lead the Raiders' wideout corps this weekend, while tight end Jared Cook figures to be in a position to rebound from his one-catch effort against the Broncos in Week 12.
Cooper sprained his ankle on the same play he suffered a concussion during Sunday's 21-14 win over the Broncos, Adam Schefter of ESPN reports. Analysis: Cooper briefly lost consciousness after taking a big hit to the head, making his concussion the obvious and more worrisome injury. Given how severe the injury initially appeared, it'll be a bit of a surprise if he's symptom-free soon enough to take part in practice for Week 13 against the Giants. Adding the sprained ankle on top of things doesn't help his chances, though Raiders coach Jack Del Rio did say Monday that Cooper is doing okay, Vic Tafur of The Athletic reports. Cooper was forced out of Sunday's game against the Broncos with a concussion. Analysis: Cooper will now turn his focus toward gaining medical clearance in advance of next weekend's game against the Giants. Prior to his exit from Sunday's contest, the wideout caught one pass, which resulted in a nine-yard TD. Cooper caught three of seven pass attempts for 28 yards and a touchdown in Sunday's 33-8 loss to New England. Analysis: Cooper wasn't targeted until the second quarter and ended up with his fewest receptions since Week 5. Still, he salvaged his day by finding the end zone after the game was out of reach. While he has the talent to explode at any time, it will be difficult to rely on the fourth-year pro against Denver in Week 12. 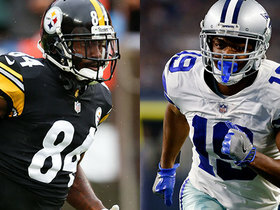 NFL Network's Steve Smith Sr. explores how Oakland Raiders wide receiver Antonio Brown's new contract could impact contract negotiations between the Dallas Cowboys and WR Amari Cooper. 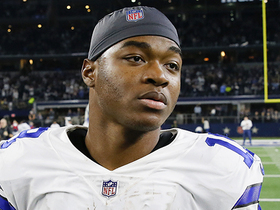 Is Amari Cooper the different the Dallas Cowboys needed to make a run to the Super Bowl? Steve Smith and Reggie Bush break it down. 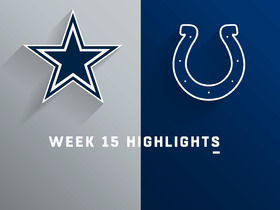 Watch as the Dallas Cowboys take on the Indianapolis Colts in Week 15 of the 2018 NFL season. 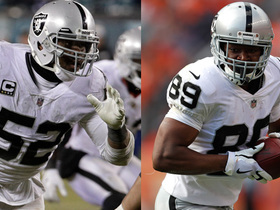 NFL Network Insider Ian Rapoport reports that Oakland Raiders owner Mark Davis has no regrets about trading wide receiver Amari Cooper and linebacker Khalil Mack. 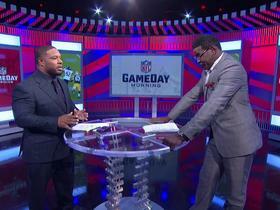 NFL Network's Maurice Jones-Drew and Michael Irvin debate which former Oakland Raiders player will make a bigger impact in the NFC playoffs. 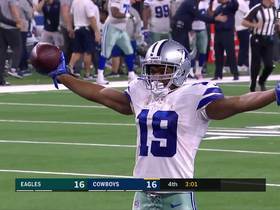 Dallas Cowboys wide receiver Amari Cooper torches Eagles defense.